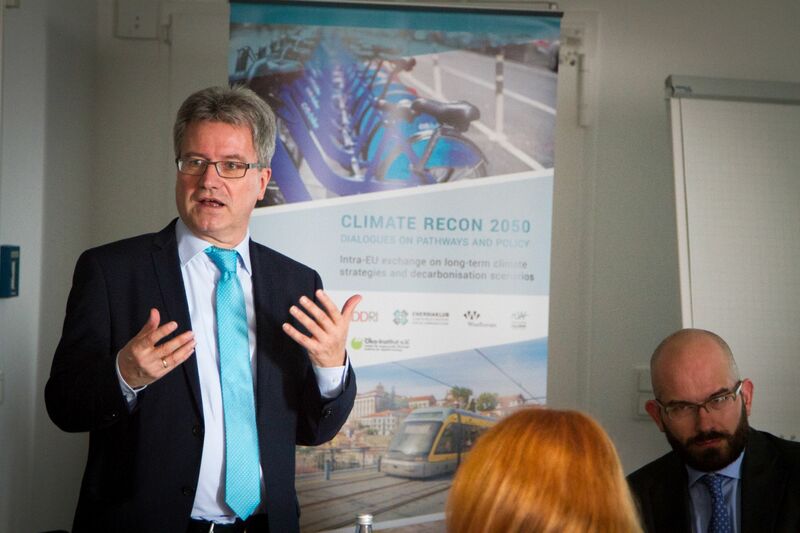 The first meeting of the Climate Recon 2050's Policymaker Platform took place in early April 2018 in Berlin and included representatives from more than 10 Member States. The workshop was opened by Berthold Goeke, Deputy Director General for Climate Policy of the General Federal Ministry for Environment. Throughout the day the meeting's participants - representatives from governmental institutions from across the EU Member States and EU institutions, as well as policy, governance and modelling experts from a number of European research institutes and think tanks - engaged in a lively discussion on challenges and opportunities that come with creating long-term national climate mitigation strategies. The workshop's varied agenda included an overview of the state of play of of the development of long-term climate strategies in the EU. National representatives provided insights and highlights from their respective strategy processes and the project team presented as an additional resource the National Long-Term Strategies Matrix - a living document that aims to capture the ongoing strategy development processes across Member States. Additionally, representatives from France and the Czech Republic provided a detailed input on methods and analytical instruments used in their strategy development. Moreover, the participants had a chance to engage in a peer-to-peer discussion on recipes and tools for describing a 2050 future, the added value of creating the long-term climate roadmaps, key questions that need to be asked and answered by policymakers during the strategy development process, shared their experiences and challenges they encountered and proposed solutions. A global overview of the long-term strategies developing around the world since the Paris Agreement was provided in a keynote speech from Richard Baron, Executive Director of the 2050 Pathways Platform, who highlighted key trends, commonalities and differences, and explained the varied approaches taken up by countries around the world working to decarbonize their economies. The meeting was by invitation only and is the first of three such workshops under the Climate Recon 2050 project.